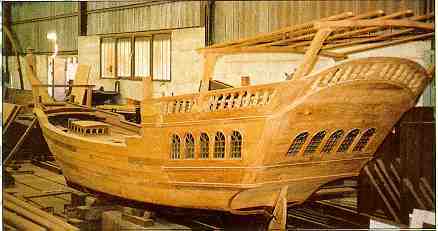 In April 1996 Wijma signed a contract for the supply of 2,400 cubic metres of timber for the construction of a prestigious wooden freighter of a type called Baghlah. The principal in Kuwait wants to build the ship using traditional techniques. This project is unique in the Middle East. Because of its huge dimensions a mention in The Guinness Book of Records is also expected. The ship's keel will be built out of six Ekki beams with a length of 10 meters each. The ship is designed to be 85 meters long and 18 meters wide. For the construction of the keel six Ekki beams were needed, each measuring 70 x 80 centimeters x 10 meters. These beams were cut to size at Wijma's sawmill in Kampen and shipped to Kuwait, where they were joined to one piece of 52 metres. Iroko was chosen for the framework, hull and decking. 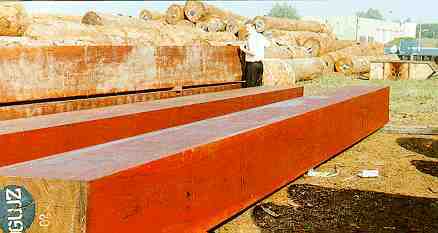 Roundlogs were shipped from Cameroon and sawn timber from Wijma's sawmill in Ivory Coast. For the construction of the framework, lamination of the Iroko timber is required. It will take another two years to finalize the project and then the ship will be used as a banquet hall. The production of the laminated wooden frames is in full swing. The six-part Ekki keel, with an overall length of 54 meters, has been completed and the construction of the laminated wooden frame is currently in progress. The Iroko frames are currently being re-sawed, finger joined, planed and laminated. To this end Wijma constructed a climatically controlled sawmill with special construction departments in Kuwait. A total of 150 frames are being constructed for the Baghlah ship. The total span of the frame at midship is 18.5 meters, from which point it curves up to a height of approximately 7 meters. The 71-layer Iroko construction consists of 41 layers of 13 mm and 30 layers of 20 mm. The total laminated area adds up to approximately 245 square meters. Lamination demands exceptionally careful preparation and planning as the procedure occurs within the brief time span of three hours, which includes an hour and a half for glueing and an hour and a half to bend the wood to the required curve. As each frame is unique in shape, a separate mould is built for every frame, after which the Iroko is laminated and curved to specifications. 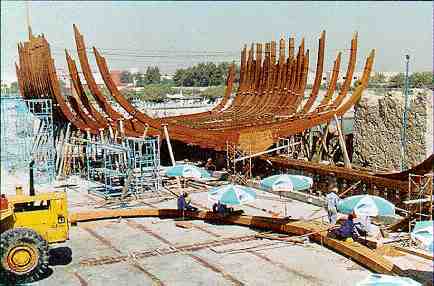 A total of 150 frames are being constructed for the Baghlah ship. Houthandel G. Wijma & Zohnen B.V.